We started the week by making a very quick “long list” of features or improvements we’d all like to see in GNOME Software and then de-duplicated and voted on which of those we thought were most important. That gave us our short list for the week and would help us focus our work on the things we thought would make the biggest difference. We started at the top of the list, working on the most popular ideas first, and spent a short amount of time individually brainstorming the idea under consideration; how it should work, what the key information was that we wanted to convey and what the user journey would be, that is how the user would navigate the feature, make informed decisions and view the results of their actions. 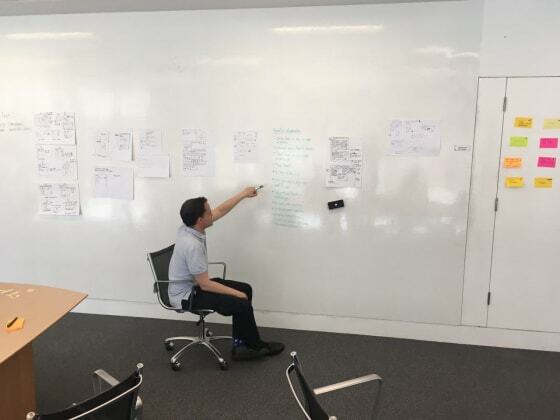 We spent around 20 mins sketching out on paper how we thought the idea should be designed and naturally came up with a lot of different ideas. 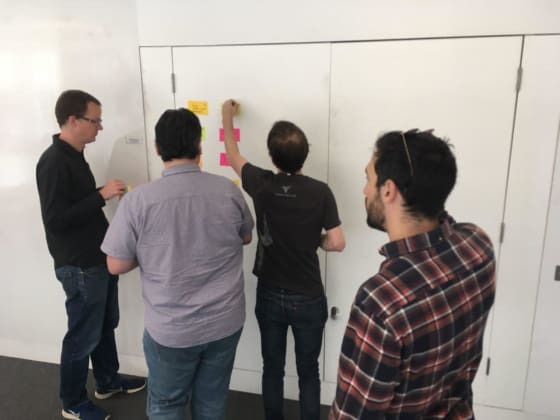 The next step in the process was to be talked through the ideas by the person who came up with them; why they thought certain actions were needed and how they thought it would work. It was interesting to see how different people approached what seemed like the same problem and to see what what they considered important. While we came up with a lot of different ideas, there were always a few common threads running through each of them. We then voted across all the different designs for the ideas we thought were best. Generally speaking, no one person had all the best ideas, everyone had an idea which could contribute to the overall problem in hand. Once voting was complete our very rough design was done and we could move on to the next one. Using this rapid prototyping methodology we were able to cover our entire shortlist in a week. The designs we came up with will of course need more work, but the building blocks are there with input from a wide variety of people. Verified publishers. Add the ability for GNOME Software to show where a publisher has undergone some kind of formal checking so you can be assured that they are who they say they are. A way to report problems with applications. Either directly to the publisher or via a central store. Better layout and the ability for publishers to add extra theming and artwork to their applications page. Subtopics here were varied, but might include things like: Badges to show that the application is popular within certain categories, its confinement level, customisable header artwork, support for animated gifs/videos. A refreshed “home” screen in GNOME Software to surface new applications, applications and addons related to what you already have installed, and news and updates from your favourite application publishers. Our initial designs will be added to GNOME’s Community Design pages on GitLab to gather feedback and everyone is welcome to get involved. These will be added as they are developed. The engineering work will be done as a branch upstream and where features are suitable they will be proposed upstream for general inclusion. We’ll start turning the quick rough sketches in to initial design ideas soon, and we will report our progress here, and keep an eye on the GNOME GitLab project for designs as they are ready.